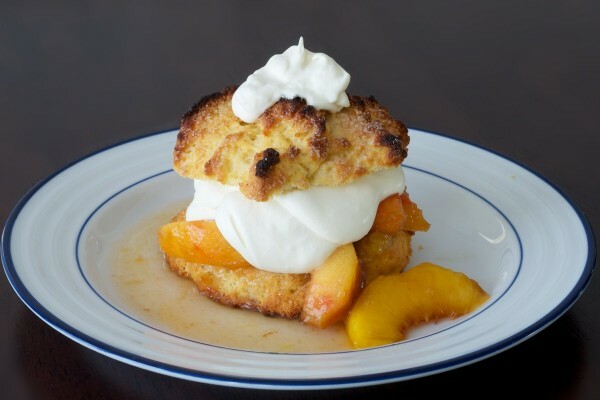 Peach Shortcake is one of those wonderful late summer treats, cool, juicy slices of peach sort of drooling their sticky, sweet juices all over a great crunchy/soft short biscuit. Simple. Seasonal. Delicious. Of course, at the moment it is February and raining, but if I don’t get some sort of break from this winter, I’ll go insane. I can’t make the sun come out, but I can make a great summer dessert, even in the winter, even with franken-peaches from an entirely different continent. Peaches don’t grow here in February. They do, however, grow in Chile. How they get here is kind of fascinating, and kind of scary. Fruit is alive, it’s flesh made up of living cells. If they die, they rot. If you are shipping fruit a long way, or storing it for a long time, you want the cells to stay alive, but to be in hibernation, so that natural cellular processes, like ripening, enzymatic breakdown of starch, etc, slow dramatically. So, reduce temperature, reduce oxygen, and the cells slow down. But don’t remove oxygen all together, or reduce the temperature too much, or the cells will die. These peaches were picked hard in Chile, probably a couple of weeks ago. They were de-fuzzed, then packed into boxes and refrigerated right away. The oxygen levels were lowered from around 20% to 4-5%, just enough to keep them alive. CO2 levels were monitored, and ethylene (a natural fruit ripener released by the peaches themselves) is removed. So packaged, they were trucked to distribution centers, then shipped via boat, or plane (!) to distribution centers here in the U.S. From there they were loaded onto trucks, and sent to my grocery store. Somewhere late in the game, they were exposed to ethylene gas to stimulate the resumption of ripening, warmed to room temperature, and exposed to oxygen again. The whole process is sort of baroque in it’s complexity, and amazing that it makes any sense from an economic perspective. I think I paid $3.50/lb for these. Somehow I don’t think that captures the real costs of such brazen energy consumption. Though surprisingly good, how do we improve these peaches? They are simply inferior to the local peaches we get here in September. They aren’t as juicy, they aren’t as sweet, they aren’t as succulent. Well, we let them macerate in their own juices after adding some sugar. Pretty standard. The tricky bit is that we reserve a quarter of the peaches, dump in some sugar and liqueur (you can use peach schnapps, I used cointreau), then microwave them until they are really cooked and breaking down. Mash em up, let them cool, then mix back into the rest of the peaches. The idea is to make the peaches more saucy, release juices, and make it all yummy. Though there is nothing particularly magical about these biscuits, no trick, this is a a simple, direct, and delicious recipe. A little sweet, a tad salty, crunchy, plenty of butter flavor, tender in the middle, yum. Combine peaches and sugar, then toss. Remove 1/4 of the peaches to a small bowl, and add booze. Microwave for 2-3 minutes until they are bubbling vigoriously, and breaking down. Remove and mash. Let rest for 30 minutes, then add back to larger bowl of peaches. Toss. Preheat oven to 425. Mix dry ingredients. Mix wet ingredients. 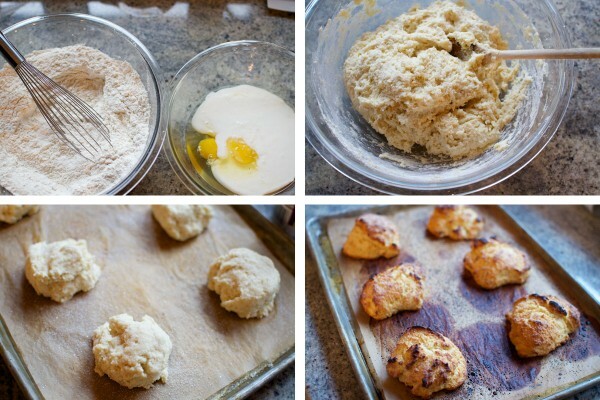 Combine, and mix with a spoon until no dry flour remains. Scoop into 6 mounds spaced evenly onto a parchment covered cookie sheet. Sprinkle generously with sugar. Bake 12-18 minutes, until golden with a few darker spots. Let cool on a rack. Whipped cream, you already know how to make. 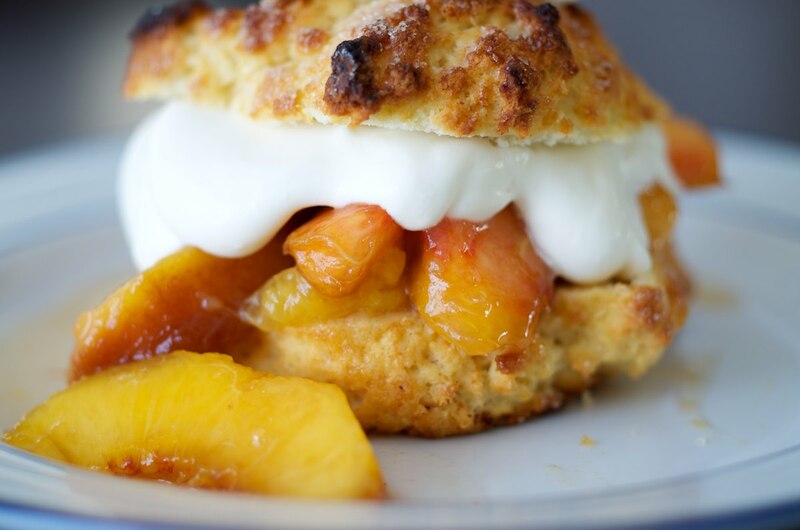 Split the biscuit, pile the peaches onto the bottom piece, making sure to spoon on yummy juice. Spoon on the whipped cream, then the top half of the biscuit, then more cream. Enjoy. This was written by cedar. Posted on Monday, February 14, 2011, at 1:31 pm. Filed under Recipes. Tagged dessert, fruit, summer, winter. Bookmark the permalink. Follow comments here with the RSS feed. Post a comment or leave a trackback. Fascinating information about the peaches from Chile! These are so good! I found the recipe in Entertaining Summer 2011, which was a free trial issue from Cook’s Illustrated, and they are so good! This was the second time making them, so the day before I compared the jam part that goes on the bottom of the biscuits with peach schnapps (our favorite) and their substitution ideas of OJ (also nice, for a neutral flavor) and Grand Marnier (we didn’t much like this one). I popped the biscuit component in the freezer to keep them from going stale since there are only two of us. Highly recommended as long as peaches are in season!!! Summery and simple yet decadent somehow.